Featuring a 14.2megapixel ‘CX’ sized CMOS sensor and an EXPEED 3A processing engine, the camera claims to offer high resolution images. An ISO range from 160 to 6400 suggests Nikon feel it will perform well in low light too. The AF system is another area of interest as the V2 is able to switch automatically between a 73-point system using phase detection and a 135-point system based on contrast that uses the camera sensor for AF. If you’re interested in capturing motion, the V2 has that covered too, with up to 15fps shooting speed when using AF or 60fps when using single shot shooting. All of this suggests the Nikon 1 V2 should be a formidable tool for capturing high quality images. Let’s see how it stacks up in the sensor tests. The previous version of this camera, the Nikon 1 V1 is ranked 137th in our sensor rating database, with a DxOMark score of 54. Interestingly, in straight overall scores, the Nikon 1 V2 actually loses ground to its predecessor, only scoring 50 for a ranking of 150th. To put this into perspective and show how technology has progressed over the last few years, a score of 50 places this hybrid camera level with the Nikon D70s, a previously popular DSLR from Nikon, launched in 2005. The Sensor scores for the Nikon 1 V2 show it does not excel in any one area, with the results for all three metrics being at the low end of the scale. It seems strange for a newer camera to perform worse in overall score than its predecessor, as we usually assume that new products bring advancements, not regression. However, if we look in detail at the results and the specifications of the camera, the reasons become a little clearer. The V2 scores 20.2bits for colour depth, 10.8Evs for Dynamic Range and 403 ISO for low-light performance. Compared to the V1, both the Colour Depth and the Dynamic Range scores are lower, while the low-light ISO score shows a slight improvement. Given that the overall DxOMark score is made up of all three of these scores combined, the relatively lower scores in both Colour Depth and Dynamic Range have had a detrimental impact despite the acceptable low-light score and the extra 4megapixel resolution. If we look at the scores from the V2 in isolation, the scores for all three metrics are at the low end of the scale. Even the improved ISO score sees the camera lose ground to competitor cameras from a range of manufacturers including the some Sony NEX models, the Canon EOS M and cameras featuring micro 4/3rds sensors – all of which perform as much as 1-stop better. Partly this could be due to the size of the sensor – the Nikon CX format being smaller than micro 4/3rds, which is, in turn, smaller than APS-C. Comparing these three Nikon stable-mates makes for interesting reading. 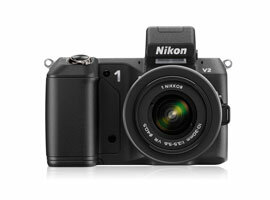 Of the three, the Nikon 1 V2 puts in the lowest performance in all areas with the exception of the sports rating for low-light ISO. Looking at the Colour Depth score, the Nikon 1 V2 shows 2/3rd of a stop less performance (20.2bits to 21.3bits). This is caused by the difference in ISO latitude – the Nikon 1 V2 has an ISO range that runs from 160 to 6400, whereas the 1 J2 and 1 V1 both run from 100 to 6400. Comparing the Nikon 1 V2 to the Panasonic GF5 and Finepix X10 shows how it stacks up against similar competition. All three cameras achieve an overall DxOMark score of 50, though they achieve their scores in subtly different ways and the 1 V2 does also offer an extra 2megapixels of resolution. In terms of colour depth, there is little to choose between them, with the GF5 and X10 both scoring 20.5bits to the 1 V2’s 20.2bits. This difference is sufficiently minimal to unobservable in final prints. In Dynamic Range though, the X10 shows how well suited it is to landscape photography, when compared to the other two, scoring 11.3Evs. The 1 V2 sits in the middle at 10.8Evs, whereas the GF5 only manages 10Evs. It is worth noting that the Dynamic Range score is the only major weak point with the Panasonic sensor in the GF5. Looking at the low-light results though, the X10 shows that it is not really designed for low-light shooting, only managing a score of 245ISO. This is ½ stop behind the Nikon 1 V2 at 403ISO and a stop behind the GF5 that performs better here, scoring 573ISO which is, to a large degree, thanks to its larger sensor. In this company, the 1 V2 finds itself somewhere in the middle when considering all three testing metrics. While the X10 is clearly aimed at landscape photography and the GF5 is more suited to low light shooting, the 1 V2 doesn’t standout in one area but produces a balanced performance that’s not skewed to any one type of photography. Overall, the regression in performance, when compared to the Nikon 1 V1, suggest this camera is not as good a buy as the V1 – its results were simply underwhelming. If you already own a Nikon 1 V1 and are thinking of an upgrade, then you’ll probably find more benefit in waiting for the next iteration to see what that brings, as the V2 will not give you appreciably better images over what you have already. If you are in the market for a new hybrid type camera, then you may find benefit looking elsewhere if you want the best image quality. Within this area, the major contenders for other models to consider are the Canon EOS M, the Olympus EPL5, the Sony NEX 6 and the Pentax K01. These five models will all suit different types of photographer and will offer better image quality performance in some areas. However, when choosing your next camera, remember that overall suitability is not just a matter of sensor capability. The ace for the Nikon 1 V2 is that the smaller sensor allows the lenses to be smaller too. If you need a small system camera, perhaps to travel with, then perhaps the more portable system size of the Nikon 1 V2 will provide the balancing trade-off between outright image quality and usability. But only you can make that decision based on your needs.